AUDIE AWARDS — A list of all genre Audie Award winners. HARD CASE CRIME (AUDIOBOOKS) — A list of all Hard Case Crime titles available as audiobooks. 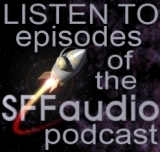 HUGO AWARD WINNERS ON AUDIO — A list of all Hugo Award winning fiction and their audio editions, if they exist. LibriVox + SFFaudio = Instant iTunes Audiobooks — a visual library of instantly accessible LibriVox audiobooks for iTunes users. SERIES — A look at some great science fiction and fantasy series that have been published on audio. STAR TREK AUDIO — A complete list of Star Trek audiobooks. STAR WARS AUDIO — Detailing audiobooks, radio drama and audio drama set in the Star Wars universe.